The global laboratory freezers market is projected to reach USD 3.76 Billion by 2021, at a CAGR of 4.6% from 2016 to 2021. The increasing demand for blood & blood components, rising government support for research activities and clinical trials, and technological advancements in freezers & refrigerators are the major factors driving the growth of the market. Untapped emerging regions are expected to offer new growth opportunities for players operating in this market in the coming years. However, high cost of laboratory freezers and growing use of refurbished equipment are the major factors restraining the growth of this market. This research study involved extensive usage of both primary and secondary data sources. The research process involved the study of various factors affecting the industry, including the regulatory landscape; competitive scenario; historic data; current trends in the market; technological innovations and upcoming technologies; and market drivers, restraints, opportunities, and challenges. The laboratory freezers market studied in this report is segmented by product type, end user, and region. Based on end user, the market is segmented into hospitals, medical laboratories, pharmacies, blood banks, academic & research institutes, and pharmaceutical and biotechnology companies. In 2015, the blood banks segment accounted for the largest share of the market, owing to the increasing demand for whole blood and blood components as a result of the rising prevalence of blood disorders such as sickle cell anemia, blood cancer, and hemophilia. The key players in this market are Thermo Fisher Scientific Inc. (U.S.), Haier Biomedical (China), Eppendorf AG (Germany), Helmer Scientific (U.S.), VWR Corporation (U.S.), ARCTIKO A/S (Europe), Biomedical Solutions Inc. (U.S.), EVERmed S.R.L. (Italy), Philipp Kirsch GmbH (Germany), and Panasonic Healthcare Co., Ltd. (Japan). 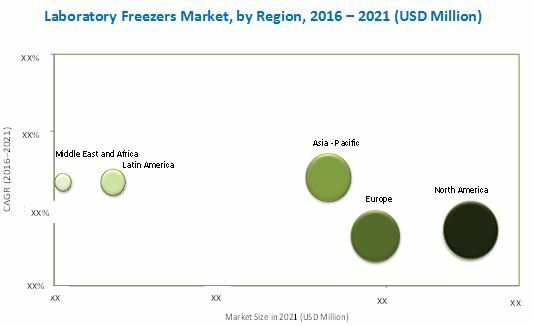 The global laboratory freezers market is estimated to reach USD 3.76 Billion by 2021, at a CAGR of 4.6% during the forecast period. The increasing demand for blood & blood components and growing number of organ transplant procedures are the key factors driving the growth of the global market. However, the availability of low-cost products from a large number of local players and increasing use of refurbished equipment are some of the major factors restraining the growth of this market. In this report, the laboratory freezers market is segmented by product type, end user, and region. This research report discusses the key market drivers, restraints, opportunities, and challenges in the global market and its submarkets. Based on product type, the market is segmented into freezers, refrigerators, and cryopreservation systems. The freezers segment accounted for the largest share of the market in 2015, and is expected to grow at a significant CAGR during the forecast period. Technological advancements in freezers and increasing use of plasma freezers as a result of the growing demand for plasma from biopharmaceutical companies are driving the growth of this market segment. Based on end user, the laboratory freezers market is segmented into hospitals, medical laboratories, pharmacies, academic & research institutes, blood banks, and pharmaceutical & biotechnology companies. The blood banks segment accounted for the largest share of the market in 2015. The large share of this segment can be attributed to the rising demand for whole blood and blood components, owing to the increasing prevalence of blood disorders such as sickle cell anemia, blood cancer, and hemophilia. In this report, the global laboratory freezers market is studied at regional and country levels. In 2015, North America represented the largest regional market, followed by Europe. Although North America will continue to dominate the global market during the forecast period, the Asia-Pacific region is expected to register the highest market growth in the coming years. A majority of the growth in this region is driven by the improving healthcare infrastructure, increasing investments by government agencies, growth in biotechnology research, and rising focus of key market players on emerging Asia-Pacific countries. The major players in the global laboratory freezers market are Thermo Fisher Scientific Inc. (U.S.), Haier Biomedical (China), Eppendorf AG (Germany), Helmer Scientific (U.S.), VWR Corporation (U.S.), ARCTIKO A/S (Europe), Biomedical Solutions Inc. (U.S.), EVERmed S.R.L. (Italy), Philipp Kirsch GmbH (Germany), and Panasonic Healthcare Co., Ltd. (Japan). 10.10 Panasonic Healthcare Co., Ltd.